ROG Sica is crafted to withstand the demands of marathon MOBA gaming, and is designed with input from pro-gaming teams like Taipei Assassins. This ambidextrous 5000 DPI optical gaming mouse optimizes click responsiveness by having the buttons independent of the mouse body, and is especially suited for those with a fingertip grip. ROG Sica's exclusive easy-swap switchable socket design even lets you customize click resistance, and it features upgraded Omron® switches with 20-million-click durability. 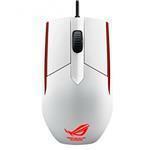 The latest ROG Sica features a glossy Glacier White finish. ROG makes sure you get the most out of your games. ROG Sica features an exclusive easy-swap switchable socket design for easy upgrades. All you have to do is unscrew two bottom screws to release the top cover to gain access to the sockets. And from here, it's simply a matter of swapping out the switches for customized click resistance.